“You could try taking an alumni course” Jorn suggests. Above, the blue sky mocks us, having chased us down and out of the alpine arena, but the warm air feels good on our skin so we soak it up. “Yeah, but I think my judgement, decision making and tolerance for adversity and uncertainty are too transferable. I wouldn’t let myself experience much what they experience, what we may perceive as misery. I think I am too smart and have too much of a work ethic for that.” I pause and methodically poke at the sand flies that try to bury their biting parts into my skin. I gaze after the group of students that just left and silently wonder with what they struggle internally and watch as they battle up a steep slope covered in loose rock. I have been walking on loose rock almost all of my life. I first climbed New Hampshire’s Mount Washington sometime around the age of six and have been exploring the mountains in one capacity or another ever since. For almost thirty years I have been traveling over boulders and steep, loose, rocky terrain. It is a skill that I have unintentionally honed over years of practice and it is now second nature to me. Coaching students in this skill is hard for me. For me, traveling over boulders and loose terrain is a mental game. Yes, there is a physical nature to it and I have the strength and agility to make it a mental game. Coaching students on strength, agility and coordination is not always practical. It is usually something, that if they do not start with, that takes a while do develop, which is what I think is great about NOLS course: we have the time to develop skills and abilities through repetition. So I talk with my students about the game I play and how it is like a version of Tetris or connect the dots. I talk about consistently looking two steps ahead and keeping a few key points in mind. Try to move fluidly. On smaller stones step on the uphill side. Move quicker than the rock. Always have three points of contact (with trekking poles). Use trekking poles. Descending through tussocks to the Ashburton River. Trekking poles. I haven’t been using them for thirty years, but my knees will someday wish that I had been. I first used them in the Wyoming Range in the summer of 1999. “Are you bringing hiking poles?” my boss, Whigger asks me. “No, I have never used them and don’t have any. Do you use them?” I question in return. “Think a pair of ski poles would work?” I ask rummaging through the back of my Cherokee and producing a pair of blue and yellow, battered, five dollar ski poles. “Yeah, those would be great, they don’t have to be fancy” Whigger responds as I set them next to my loaded pack, unaware of the long term relationship that would develop. Thirteen years later they are still essential backpacking and mountaineering equipment. Since upgrading to a pair of Black Diamond poles that were given to me by my college instructor, I have taken them everywhere. We stand up, shoulder our packs and move on from the Potts Hut, cruising down the rocky, loose banks of the Potts River. The travel is easy and we catch up with the students despite the half hour head start. The next day we push onward to the road and our pickup; our route is ten or twelve kilometers of toil over endless fields and hillsides of tussocks. Tussocks, grasses that grow in the form of a clump, can reach up to a meter and half in height. In New Zealand they cover vast expanses of the south island. 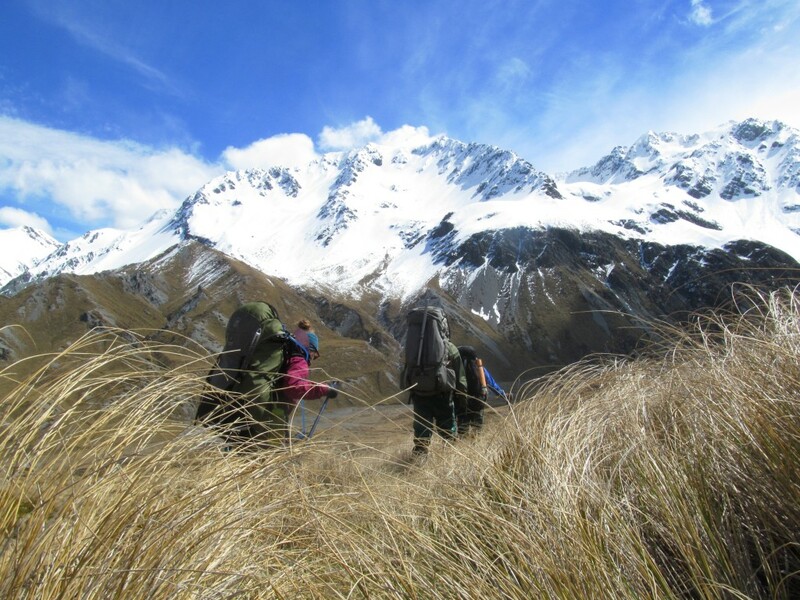 Thirty years experience of rock hopping and travel on loose terrain and judicious use of my Black Diamond Flicklock Expedition trekking poles not with standing, I still can’t walk through the tussocks of New Zealand’s montane. While their shape and form helps it survive fire and drought, it simply inhibits me from traveling efficiently. I have only been walking amidst the snow grass tussocks for a month or two now and even then it has not been frequent. Learning how to read the bunch grasses is challenging. Being able to not trip, figure out where the holes are, not slip and move efficiently still eludes me. The trekking poles help for sure but I still slip, slide and stumble. The kilometers pass slowly as we make our way out to the road, the tussocks taking their toll. My left foot traps a strand or two of the incredibly tenacious Chionochloa then my right foot catches the loop that was created and I once again fall flat, my 30 kilogram backpack driving my face into the ground. I stand up and see Jorn prancing on merrily ahead, completely unaware of the beating my ego (and body) is taking ten meters behind him. I shake it off and move forward slowly and methodically, realizing that, if only in part, I again, feel like a student.